Hi everyone. 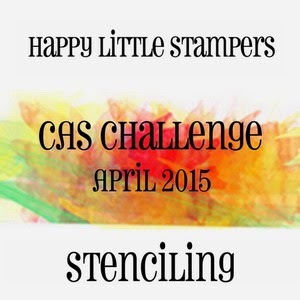 Back with a reminder of the April Happy Little Stampers CAS Challenge - Stenciling. This is the card I made for my hubby's birthday which was just a few days ago. I used brushos (just the brown which has other colour pigments in it) to create the backdrop on mixed media paper. This was my first time playing with this paper --- so fun, and it gives a different look than the brushos on watercolour paper. Love it!! I'm entering this into the ATS&M #139 - CAS Challenge. This time I was channeling my friend Deepti. I love all her cards she's made with this awesome layout and wanted to give it a try. I sponged over brown card stock with a basket weave stencil that I cut with my Silhouette Cameo. I sponged the same colour ink as the card stock, so it gives more of a subtle design. I cut the top piece from white with a stitched border die. I then added sprigs of greenery, along with some hot pink flowers . A large hello sentiment is stamped in the same brown ink. 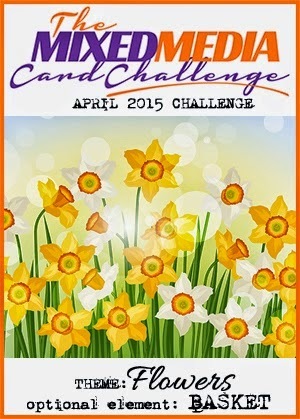 This is a reminder for the current challenge at Mixed Media Card Challenge - April - Flowers with optional element of Basket. I hope you'll join us and play along! And I'm going to enter this into Virginia's View #14 - Layers and Dimensions Challenge. And the challenge at Simon Says Wednesday Challenge - April Showers. Beautiful cards, Loll. Fabulous use of your stencils. Both are beauties Loll! Love the browns, such a nice masculine card for your hubby! Two gorgeous cards, Loll! 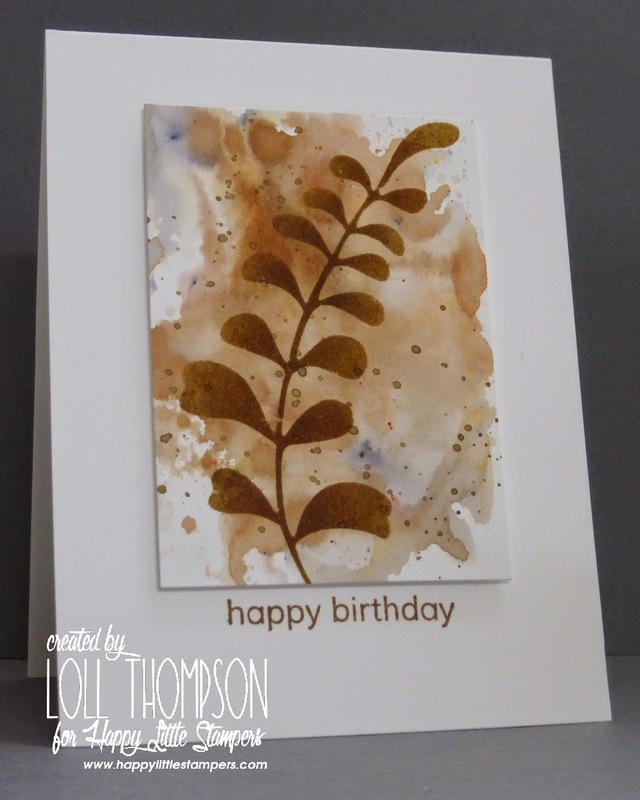 I love the brown fern and how you created your background on your first card! I'll bet your hubby loved it as well! 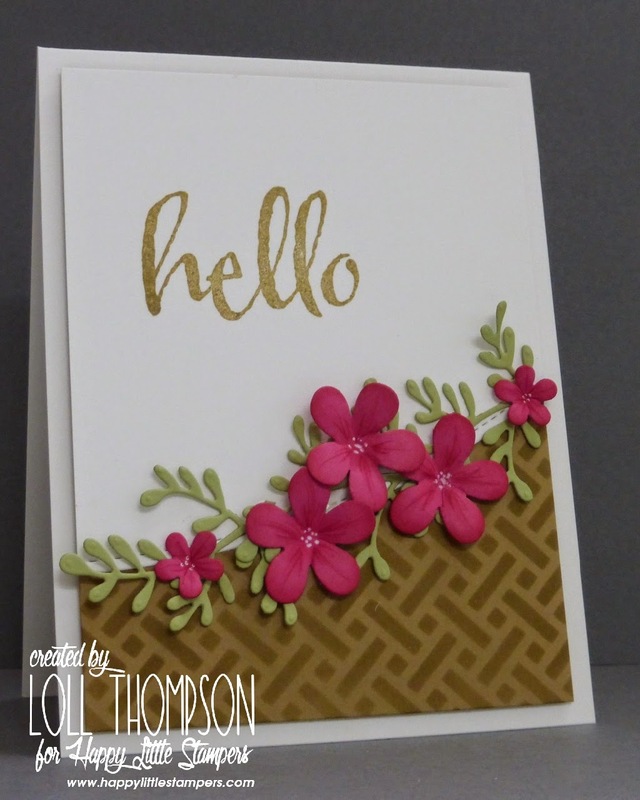 Love the stenciled pattern on your 2nd card, too and the flowers are amazing! Thank you so much for playing along with us this week at ATSM! This is beautiful, I can see why your husband liked it, the background is gorgeous and the stenciled fern is fabulous. Two gorgeous cards, Loll, but I especially love the Brusho one. Isn't it great to see the result on a different type of paper? The stencilled fern turned out perfectly, and the splatters add lots of interest. What a pretty design, Loll! Love your springy posies! Thanks for sharing this with us at the Simon Says Stamp Wednesday challenge! Oh such AHmazing cards Loll. I just love the color wash background and how genius , your stenciled corner with the flower border. Beautiful! Hey Loll... hope you´re feeling better !!! it looks sich great and amazing to me !!! Two stunning cards Loll, love the 1st one that background is brilliant! If I tried that it would look as if I'd spilt my tea on it!!! Gorgeous flowers as well. I love the fern card! Wonderful job of the background and stenciling! Brown could be very dreary, but this definitely is not! Love the pretty flowers and the stenciled basket too! Very springlike! Wow, your stencil techniques are out of this world!! I wouldn't even know where to start using these colours but you've made this look so serene and stylish, its quite incredible. Always so happy to see you at ATSM!! What a great masculine card, Loll! Love it. Playing catch-up: love both cards, especially the fern card with the hints of colour from the other pigments in the Brusho. Other pigments in the brown Brushos? How cool is that? It looks amazing. Pairing it with that fern was a fabulous idea. Not at all surprised that he loved the card. Love the contrast of colors! Rich and beautiful, Loll! 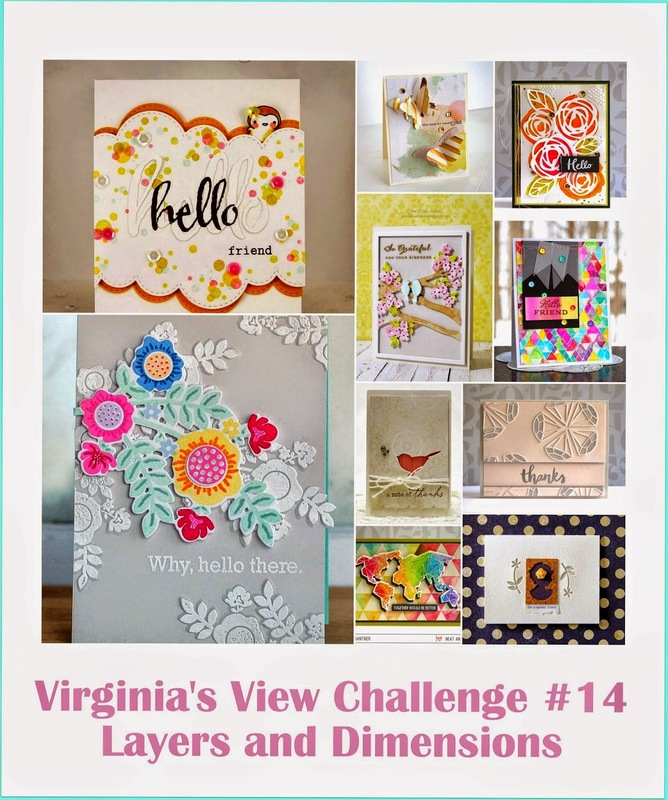 Thanks so much for playing Virginia’s View “Layers and Dimensions” Challenge! Hope to see your lovely work soon again!